We all know a buck’s usual behaviors, especially during rut. They urinate on their beard, legs, and face, exuding a musk so strong it makes your eyes water from yards away. They stick their tongues out and blubber a delightful love song to the girls. But why would a buck not exhibit any of these behaviors? What would cause an intact buck to act placid and uninterested in a doe? The first time I ran across this particular issue was an article by Fias Co Farms, who talked about a buck they raised that saw his owners as his companions and does, and ignored any actual caprine females put with him. Years later, a friend of mine raised a sweet little Nigerian Dwarf buck on the bottle, and when it came time to breed, he simply had no interest. He never rutted, and eventually she wethered him and sold him as a pet. I kept this in the back of my mind, but it wasn’t until just a couple years ago when I encountered yet another young buck who “wouldn’t buck” and took a shot at trying to get him back on board. Before we moved to the dairy, we had some fabulous neighbors who were just starting to get into Nubian milkers before we left the area. They raised a very handsome little buck along with two doe companions, who got along great. They were well cared for, well loved. However, when autumn came close and the girls were supposed to be going into estrus and the buck into rut – nothing was happening. They reached out to me for advice, and after mulling it over a bit, I told them to bring him here. Bring him to Buck Camp! My thought was that this was a mixture of issues – Pinky, the buck in question, had been raised with his little friends and only ever exposed to them. I felt as if they too might need a jumpstart – if you’ve ever heard about the “Buck Effect” (which I should write a post on someday too, thinking of it) you know what introducing a strange buck in rut to a herd can do. Here at the dairy, we had an entire pen full of bucks in raging rut, urinating on everything that came near and bellowing their beautiful amorous noises at the does peering through the gate at them. If these guys couldn’t help teach Pinky how the world works, then nothing would. It was definitely worth a shot. Pinky arrived looking very confused, and after a short quarantine period, in with the bucks he went. They immediately fell upon him as if he was a doe, bashing him about and mounting him. Poor Pinky! He had quite a shock coming to Buck Camp, a place filled with more testosterone than Super Bowl Sunday at the local bar. Within days however, he had settled in, and I could almost see his brain working as he watched the other bucks go through their wooing behaviors. 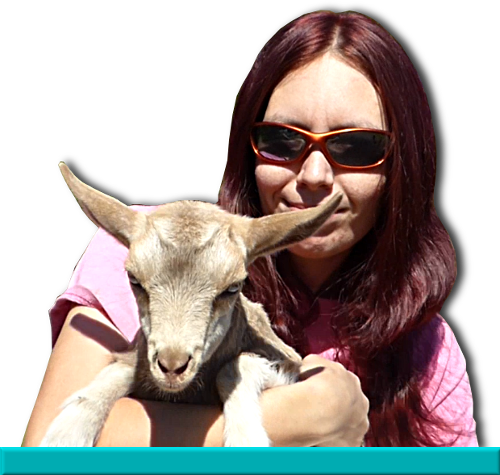 Several times I pulled him out and put him with a doe in heat, letting him smell and explore all the wonderful things a female goat might have in store for him. Slowly, he began to show interest, curling his lip back over his nose in the classic Flehmen to smell their pheromones, and he even started to paw at them. He did not gain enough confidence to mount one of our bossy standard does, but after two weeks, I felt he was ready to go home. I was hoping that his little girlfriends at home would be stimulated into strong heat cycles at his return, which would hopefully kickstart his brain at long last. So Pinky was loaded into the backseat of a truck, missing his scurs that the other bucks had knocked off for him, smelling much more ripe, and I swear he had a big smile on his face. I wished my friends luck, and told them to let me know how Buck Camp worked out for them! Well, it worked pretty darn good. Just five months later, kids hit the ground. Buck Camp was a roaring success. Socializing your young bucklings, especially bottle raised bucklings, is important. Bring them in with your does – let them chase and blubber and do all the things they’ll need to know as an adult. Don’t let mature aggressive does beat on them excessively, possibly frightening them away from others. It’s a real shame to raise a young buck for months, only to find it was wasted effort when he cannot produce kids for you. And if all else fails – consider Buck Camp if you can! Pinky’s proud smile speaks for itself.